We’ve all seen and heard the devastating pictures, the alarming footage and heart-breaking stories. A lot of us have also delved deep to support the Disasters Emergency Committee’s Philippines Typhoon Appeal in whatever way we feel we can. In a nutshell, Typhoon Haiyan hit the Philippines on Friday, November 8, causing catastrophic damage across an area where thousands of people were already homeless after an earthquake in mid-October. The 300-mile wide typhoon left a trail of destruction, with thousands feared dead. The full extent of the damage is only becoming apparent now as rescue teams reach the more remote areas. Philippine Red Cross volunteers have been on the ground since before the storm hit, helping with evacuation plans and warning communities. Now, they are getting aid to the people most in need and preparing to help thousands more. I’d rather be writing about other stuff – exclusive interviews with my literary and musical heroes; new and old albums, books, films and gigs; my football team; under-valued classic cinema, commemorations of public figures or reluctant heroes; or just a general misty-eyed nod to halcyon days gone by. But sometimes there are stories much more worthy of taking up big chunks of this huge interweb thingy. 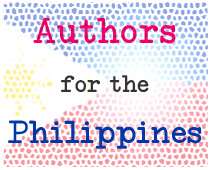 And Authors for the Philippines is one of them. These past couple of years while setting up as a freelance writer and working towards getting published, I’ve been lucky enough to speak to a few authors who have made an impression on me. And this past week several have come together to help international aid efforts in the light of the Philippines typhoon. Their efforts may not be hands-on efforts in the danger zone, but could make a real difference in this latest humanitarian crisis, raising funds for aid by donating signed books or original artwork, arranging author visits or offering chances to get your name in a book – either as a character or a listed sponsor. The main movers and shakers in this internet charity auction, raising money for the Red Cross’ Typhoon Haiyan Appeal, are London-based Philippines-born writer Candy Gourlay (left) and fellow children’s fiction writer Keris Stainton. And very quickly a lot of people in the book world agreed to help their cause. As YA author Keren David put it: “We’re getting a fabulous response from the publishing world – big names donating stuff like Simon Pegg, JJ Abrams, Philip Pullman, Malorie Blackman, David Nicholls, and many more. 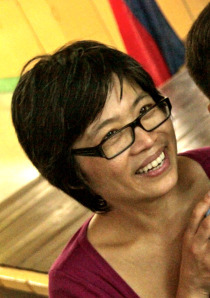 It’s fair to say Authors for the Philippines is already proving a real force for good. There are too many names to mention here, but I’ll at least mention some of those who either jumped off the page (so to speak) for their high-profile status or I’m just happy to plug anyway (and in some cases the authors hit both of those categories for me). 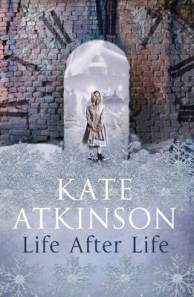 So step right up and bid if you fancy a signed hardback of Life After Life by Kate Atkinson, your name as a character or to to name a character in the next book by children’s laureate Malorie Blackman, or take advantage of a free author school visit or event involving Tony Bradman, complete with a free box of signed books for your school. You can also be a ‘halfman’ in Melvin Burgess‘ next book, receive three signed and personalised Cathy Cassidy books, enjoy a selection of signed Lucy Coats books and arrange an author visit, or receive a dedication in Steve Cole‘s first Young James Bond novel. Then there’s a chance of signed books from YA author James Dawson and a character name in his next book, a first edition of The Graveyard Book signed by Neil Gaiman and Chris Riddell, or a special signed limited edition of Sally Gardner‘s Maggot Moon. How about some original artwork by Emily Gravett or a character name in Matt Haig‘s next book (with a mention in the acknowledgements)? Alternatively, perhaps a signed, full set of Emily Windsnap books by Liz Kessler, or four-book signed set by Linda Newbery. Others might head straight for a signed limited hardback of David Nicholls‘ One Day plus signed shooting scrips for the film version of that and Starter for Ten, the signed, personalised copy of Simon Pegg‘s Nerd Do Well or a signed hardback of The Good Man Jesus and the Scoundrel Christ by Philip Pullman, or perhaps original artwork from the Harry & The Dinosaurs series by Adrian Reynolds or a 2003 manuscript of Meg Rossoff‘s How I Live Now. 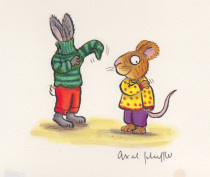 Then there’s original Pip and Posy artwork by Gruffalo artist Axel Scheffler, a signed copy of Tracey Thorn‘s Bedsit Disco Queen, or an original illustration by Clara Vulliamy along with her Dixie O’Day book signed by both the author (which just happens to be her mum, Shirley Hughes) and the illustrator, or even three signed Holly Webb books. And although that list seemed to go on for ever, believe me – that really is just skimming the surface. So how do you find out more? Well, head to the http://authorsforphilippines.wordpress.com/ link, find an item you’re interested in bidding on, then click on and leave a comment detailing how much you would like to bid. But you need to hurry, as the auction ends this Wednesday (November 20), at which point the winning bidders will be contacted and asked to donate directly to the Red Cross and send confirmation of payment. On receiving that confirmation, the relevant author will then contact those winners. In other words, the authors aren’t dealing directly with donations, which go directly to the Red Cross appeal. That’s about it from me. No pressure, just taking the chance to further spread the word and hopefully help that aid get through. This entry was posted in Books Films, TV & Radio and tagged Authors for the Philippines, Candy Gourlay, Cathy Cassidy, David Nicholls, Disasters Emergency Committee, Keris Stainton, literature, Malorie Blackman, Philip Pullman, Philippines, Shirley Hughes, Simon Pegg. Bookmark the permalink. No worries, Candy. Hope it all comes together – there are some big bids in there! You’ve clearly worked hard on this.